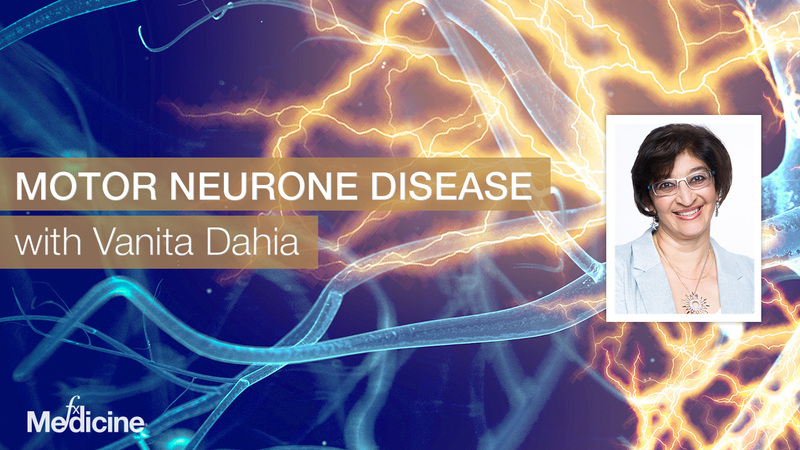 Chronic Inflammatory Response Syndrome (CIRS) is emerging as a potential causative factor in many confounding illnesses. Put simply, in CIRS, the immune system is perpetuating a cycle of inflammation to a trigger of some kind that the person's biology is not able to rebalance from. Frustratingly for both patients and clinicians, there is no clear path to diagnosis. 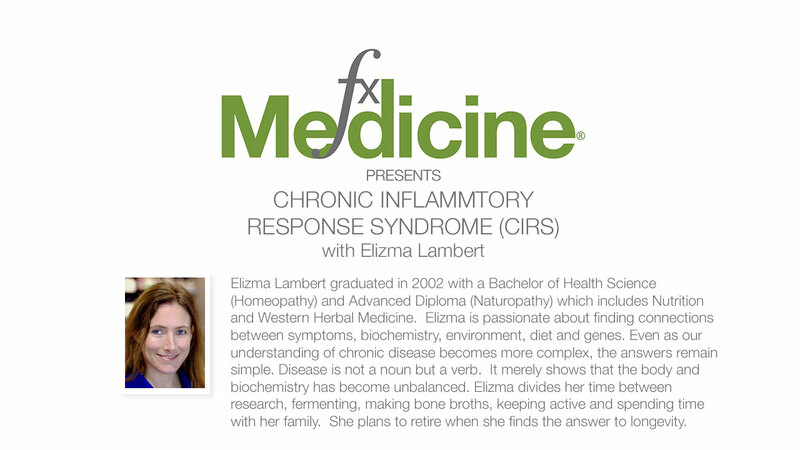 Today we are joined by Naturopath and Homoeopath Elizma Lambert, who with her avid interest in areas such as genetics, pathology and the many intricacies of clinical practice, has come to travel the world to both learn herself, as well as teach others about how to unravel the many layers to the CIRS patient. 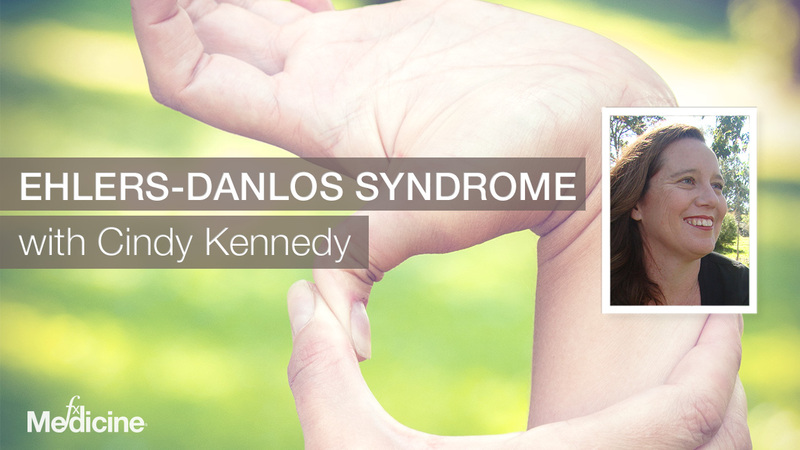 She joins us on FX Medicine to give us an insight into the approaches she's adapted to identify and help CIRS sufferers. [04:28] What exactly is CIRS? [07:09] What makes your susceptible to CIRS? [11:23] Is CIRS a new "disease"? [15:16] How common is CIRS? [23:14] Static Shock: a marker for CIRS? [25:04] How do we test patients for CIRS? [29:51] What is the treatment approach for CIRS? Andrew: This is FX Medicine, I'm Andrew Whitfield-Cook. Joining me on the line today is Elizma Lambert who graduated in 2002 with a Bachelor of Health Science, Homeopathy and an Advanced Diploma in Naturopathy which includes Nutrition and Western Herbal Medicine. Elizma is passionate about finding connections between symptoms, biochemistry, environment, diet and genes. Even as our understanding of chronic disease becomes more complex, the answers remain simple. Disease is not a noun but a verb, it merely shows that the body and biochemistry has become unbalanced. Elizma divides her time between research, fermenting, making bone broths, keeping active and spending time with her family. She plans to retire when she finds the answer to longevity. You can find out more about Elizma at realizehealth.com.au/elizma-lambert. Welcome to FX Medicine, Elizma how are you? Elizma: Oh, very well, thank you Andrew. Andrew: Now you've been overseas or are going overseas soon aren't you, to do some lecturing? Elizma: That's correct. Yeah, I have been overseas the last few months. Going to the U.K., going to the U.S. and I may be going to Scotland and to the U.S. to teach practitioners about various aspects such as organic acid testing and so forth. So there's been a lot of opportunities opening this up this year for me. So yeah, well, we'll see where the year takes me. Andrew: Now today we're going to be talking about quite a complex syndrome that’s; Chronic Inflammatory Response Syndrome or CIRS. But I guess before you take me through a definition of what that is, can you take us through your background and how you came to be in natural medicine. What directed you towards natural medicine in the first place? Elizma: Well, Andrew, I was brought up in a household in South Africa where my mother used to take us to a homeopath whenever we got sick. Which wasn't very often, which is good. But it sort of like gave me a natural gravitation towards natural medicine and so I studied for about four years in South Africa and then another two years in Australia to get my qualifications in Homeopathy and Naturopathy. And my children were actually the ones who really perpetuated my development as a practitioner. Because they both had challenges with language development, ADD and other symptoms where the medical profession wanted to sort of like throw a label at them. And I just was not interested in labels, I wanted solutions. And so it forced me to do my own research, and at that point there wasn't really that much available in Australia, and so, I had to take my research to the States where I found a lot of therapists and things that helped them. And I guess, you know, the rest is history like they…we've resolved all of the issues. And it sort of like taught me a lot of things which I even today base my practice on, on that experience. That it doesn't matter what you call a disease or a disorder, but it’s, all of it, is just biochemical processes that has gone wrong. And if you can identify the challenges, the blocks sor the inhibitions in the biochemistry, and when you remove these, then everything can just flow as it should, and then, you can pretty much treat anything. So it's exactly what you said earlier about a disease being a verb and not a noun. It is a process it is not an entity on its own, so that's how I treat everything in my practice. Andrew: Yeah, okay so you've grasped something quite complex, something which eludes me and that's CIRS. Can you take us through exactly what this is and what it encompasses because it's really like a ball of wool to me? Elizma: Yeah, it is. It's a big, huge rabbit hole. It goes into more rabbit holes. Because CIRS as you pointed out stands for Chronic Inflammatory Response Syndrome. And it is a body-wide inflammatory condition and pretty much the chronic version of SIRS which is Systemic Inflammatory Response Syndrome. But it is also commonly known as Biotoxin illness or Mould Toxicity Syndrome. Even though it can actually be caused mainly other organisms as well. And so you can divide CIRS into different subtypes. That's why you can get CIRS acquired by exposure to water-damaged buildings, you can get CIRS acquired Dinoflagellate and algal sources, you can get CIRS acquired from stealth pathogen sources such as Borrelia. But, you know, really you can add a lot of other organisms and toxin sources to that list. Because it's any organism that can trigger a Chronic Inflammatory Response Syndrome that can actually be grouped in here. And the only thing is that it's the Mould Biotoxin illness in the line that gets all the publicity, so that's why the focus on that. But they are really only just two causes of CIRS, and in fact, mycotoxins only makes up about 1% of the problem. They are finding that a lot of inflammagens such as endotoxin, betaglucans, pymalycin, proteinases, mannens, nose. It's just so many compounds even you know volatile organic compounds, they can all play a much larger role in developing CIRS but they are just much harder to see. And so CIRS is really an immune system reacting to a foreign antigen and that is what makes you sick. And if this, if the inflammation just keeps on perpetuating...all this response just keeps on perpetuating, then it becomes a chronic response. And so CIRS can mimic a lot of other chronic health conditions as well such as Chronic Fatigue Syndrome, Fibromyalgia and Multiple Sclerosis. So there's a lot of overlap with these things and sometimes it becomes hard to diagnose. But it really...if you can sum up in one word, it's just inflammation, chronic inflammation. Andrew: So what happens to go wrong in the body that these patients' immune system recognises it as a threat, whereas a lot of us are still exposed to moulds, still may be coming to contact with Dinoflaggellates, there are those people overseas that get infected with Lyme disease and recover. You know there's controversy in Australia, even though they found a Borrelia, but people keep calling in Lyme which I don't think it is because we haven't got that species. So we've certainly seem to have at least Borrelia here. You know there are those of us that come in contact with these threats, let's say, or noxious entities, but we don't react in the same way as people who get CIRS, what goes wrong? Elizma: Well, one of the important aspects here is, you know, that genes can actually play a huge role here. And so what they’ve found is that those are gene mutations on a subset of genes, and it's the HLA-DRB1, D2, B1, DRB3, DRB4 and DRB5. And so they’ve found that people with these kinds of gene mutations are more likely to develop this inappropriate immune response, and be susceptible to getting sick from being exposed to mould or other infections. And so there's about 54 HLA-DR genes relevant and about 150 sub-types which can make it very confusing. And it is gotten really, very, very complicated. But we're using it now more as a kind of a guide post. So what it indicates is more of a relative risk in a group of people that are more susceptible. So the more mutations you have, the bigger the risk and the more susceptible you are. And so these kinds of people they will be more susceptible to develop CIRS after being exposed to a trigger such as mould. So again, just testing positive for an HLA gene mutation doesn't necessarily reflect what that HLA gene will do. So these genes are sort of like shaped like clefts and then the antigens, when you are exposed to an antigen, will enter this cleft, where they are then sort of like, recognised by the amino acids. And that’s part of our genes. And some of the amino acids are permissive, which means it will allow the antigen to then enter the cleft and then leave without being recognised. And so this means that the antigen now has become like a stealth pathogen where no antibodies are actually made. So there's no protection from the acquired immune response. Then you get this constant activation of the innate immune response. And so susceptible people will just stay sick for longer even after they are out of the environment which has made them sick in the first place, whereas non-susceptible people will get better. And so, in the sick people's immune system, they are not targeting that organism and eliminating them, it's like it bypasses or yeah, it just bypasses the immune system. The immune system is just not seeing it. And you know, you’ve got to remember that we are born with the HLA genes but we are not born with CIRS. So there has to be an event that set this whole thing up. You know it could be something like Lyme, or it could be something like even mono or some kind of a viral infection or something that just has to initiate this process but it's not necessarily the perpetuator of the process. And so I think gene involvement is a big one here and I'm just talking about the HLA genes here, but you know, we could also include things like the glutathione genes, the SOD genes. If someone has just very poor susceptibility or a poor ability to clear toxins in general, all of these actually just add up. And I think this is just why some people you know really struggle to get better and why disease are becoming more complex and we have to really think beyond the square and how to help people get better. Because it's not the usual things that can make the biggest difference anymore, there's now all these other nuances that comes into play. Andrew: I've got to say like you know when I first heard about CIRS I was extremely skeptical. The reason that I was skeptical was that I was thinking, oh well, you know “how could it be a new disease?” You know, are we just seeing the new flavour-of-the-month diagnoses sort of thing? But then I started thinking, I thought, hang on we used to call tuberculosis, “consumption”. There is no diagnosis in the 1800s for Irritable Bowel Syndrome. So, what were these people experiencing before? Like back in the '60s, '70s, '80s when we didn't have the diagnosis of CIRS, what were they termed as, were' they just lumped into chronic fatigue or? Elizma: I guess that, you know, we could see it as that you know, and I seem to agree with you Andrew is like we you know...it's not about giving something a new name and you know we do tend to do that. I think this is why we have to be careful and not saying well “you've got CIRS” as a condition. It’s...again, it's recognising that this is what the biochemistry’s doing, it's stuck in the chronic inflammatory syndrome. And I tend to agree with you, I think a lot of those past illnesses could be classified in same grouping, because we're just talking about biochemical processes here. So I am very careful not to try and make it as a disease. Because that's what we tend to like to do is just make up diseases, and, yeah. Andrew: How did you first become interested in CIRS as a condition, or a group of conditions, to treat? Elizma: Yeah, well, you know, it was actually at one of Ben Lynch's conferences. It was this SHEICON2016. Where I heard Dr. Keith Berndtson, I hope I said that correctly, but I heard him give a talk on CIRS relating to mould, Biotoxins and Lyme. And it was the first time I heard about it and I was very, very interested. So I started researching it and I found that so many people had these kinds of symptoms and they failed to get the help that they needed because it was still a relatively unknown subject here in Australia and I think it still is. But it was already being talked a lot about in other advanced countries and they were testing for these chronic infections and they were testing for things like mould. Which I think is actually a really big problem here in Australia and especially in Queensland with the level of humidity we experience. So it wasn't really about a new disease but it was interesting that the testing that was being done for it was so much more advanced than what I was used to here in Australia. So they were testing for organisms that we do not usually test for and they were like I said testing for mould Biotoxins which, you know, it surprises me how many people, if I send them back home and they go look for it, they find huge amounts of mould. And yet we are not recognising that as another source or another root-cause of possible illness, you know. I think it's going to change definitely in the next five years or so, and again, we have to be careful to not just see everything then as mould, mould, mould, mould. But it is in a very important...another exposure that we need to be aware of especially in, you know, humid climate such as the Queensland climate. So I just felt it was a very under diagnosed, very under-appreciated and, yeah, it just made me.. look at things a little bit differently, especially the hormonal involvement. When you started looking at CIRS and how it influenced the Neuropeptides and the brain hormones and neuro-transmission everything. It just really made sense why people get all this multitude of symptoms with all kinds of chronic inflammatory disorders. So for me it was a huge connect the dots moment, it was just like, wow you could see the immune system connecting with the brain, connecting with the hormones, connecting with just everything. And so I guess that's what sort of like tweaked my interest into it. Andrew: I've got to say Nicole Bijlsma shook my head around basically, enlightening me to the prevalence of mould issues. I mean it did just absolutely stunned me. And then I started to think and think, you know I thought, "Uh, we don't have a mould issue in our home." And then I thought hang on, and then I see suddenly little bits around the house and it's not a huge issue but little bits of you know, soffits and or part of the eaves that might have a bit of a mould issue on it. And I go, "oh well," you know "it's...mould will grow where it can, given the damp environment." It's just amazing, but again what interests me is these people's response. So how common is CIRS, are we seeing an explosion of this, are we looking for it and therefore we're over-diagnosing it? Elizma: You know, I think, you could be on to something there, I'm not actually...I don't have the statistics in front of me in terms of how common it is. But I think it's one of those things that can...we need to be careful that, it becomes our chronic fatigue syndrome, where it becomes this huge label. And I think in that aspect, I think it's actually quite common just because of the amount of, you know, when I do...when I see people come through my doors and it could just be my client population, I see the strangest kinds of infections. Now whether we are testing more for it I think that is definitely a valid point. We are testing now for viruses and bacteria and parasites as we haven't tested for before and now it's showing up. But I also think people are getting more answers, like a lot of these people have been left high and dry by the medical system and even by other systems in that no one knew what to do with them. So they would just end up going through life, you know, with ill health and no one being able to help them. So that we just have more tools now with genetic testing and everything else and we can now pinpoint things. Are they getting better because of the testing? No, that's another argument we can have. Because I know of people who've been on treatment for many, many, many years for these kinds of conditions and they don't really get any better. So I think it's such as, you know, not talking about CIRS as a condition but just all these infections and all these exposures. We still don't know what to do with a lot of these things. I think we still...we're in the learning processes of treatment protocols. And I don't like the word...to use the word "protocols" because I don't believe in protocols. But I think we're still very much in the beginning stages of learning how we can get rid of...you know, how do we get rid of viruses? How do we get rid of all these things? So I think we are better at diagnosing and getting answers for people but I don't think we're necessarily quite there yet in terms of the treatment. But we're understanding now the role that these organisms play more so in our general biochemistry. Because if you think about it Andrew, in the past if someone had, you know, like a mental illness, Schizophrenia or depression that was what they had but now we're connecting a lot of those mental symptoms to infections and to things like CIRS. We're starting to connect things that were just fobbed off as you have this disease, this disease, this disease. And now we're seeing it more as a global body dysfunction. So I think maybe we are over-diagnosing CIRS? I don't think it's more prevalent, I just think we're now starting to categorise these other diseases like Schizophrenia or depression or hormonal disorders, we can start to actually regroup them into something like CIRS because we're understanding better that these are not isolated illnesses. That they are part of a bigger body response. So I think we're just really reclassifying things and sort of, you know, putting things into new bags and putting new labels on them, yeah. Andrew: Yeah, yeah. You know, to me it seems to be kind of like, that in the past we looked at alcoholism as a disorder, as “the problem”. Whereas now we really look at alcoholism as a symptom of what's going on. Something is causing alcoholism to occur, that's the reason they're driven to drink if you like. Is that sort of where you're heading with this, that we now have a classification, if you like, of what might...of a group of things that might be going on and we term it under one banner but it's really a flag to say there's something going on here rather than what we should be falling down a diagnosis “box” as you say, yeah? Elizma: That's correct. You know, we could say that's....we see CIRS now as more of a recognition of root-cause. Because, you know, 50 years or so ago...and you can take a Microbiome as a good example. I mean, how long have we said that gut bacteria had an influence on the brain and the medical community just didn't want to accept that? But now it's the new “big thing” isn't it? 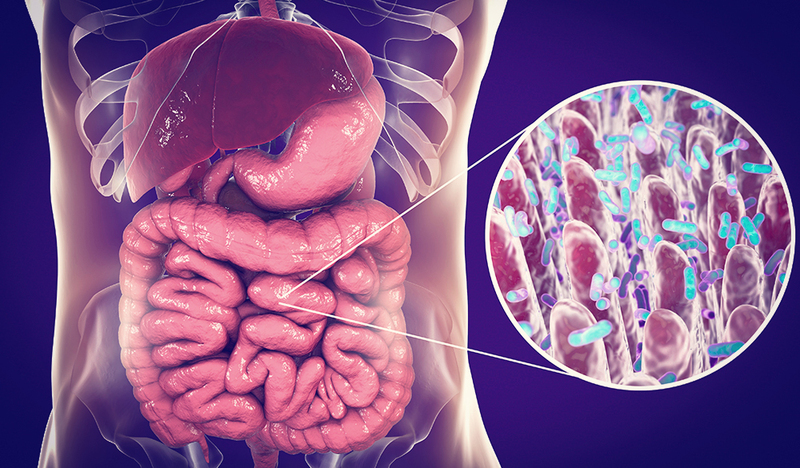 Everyone's now recognising the role of the gut Microbiome in all these illnesses. It's the same with CIRS. it's really just a banner to say hey all of these things that you classify diseases has a root cause, and the root cause is going to be some kind of a bug, some kind of a mould, some kind of a toxin and this is the way the body responds to it in this inflammatory process. And if you don't remove the exposure, the inflammation will just keep on going and creating these biochemical dysfunctions. So I think it's just really recognition that there are root-causes that we haven't seen before because we didn't recognise that a root cause can actually cause these kinds of responses. So I think it's that same thing. We're just really starting to appreciate the environmental influences on things that were commonly just labeled as a disease. And now we're seeing that, no, it doesn't work like that, there are always some kind of an exposure or a root cause that we need to look at. So that's I guess what you could see CIRS as, it's just a recognition of that. Andrew: Yeah. So okay, let's talk about the key signs and symptoms of somebody with CIRS. What sort of things go on, I'm imagining all sorts of issues because it's a general sort of thing which could present on any number of ways, is that correct? Elizma: You are very correct Andrew. So, you know, it's going to sound like the same old, same old when I say the symptoms because you are right, it is a very globalised kind of signs and symptoms. So, you know, you'll get things like your chronic fatigue with a lot of cognitive issues or brain dysfunction. A lot of executive cognitive function problems because a lot of the brain areas gets affected with CIRS. It can be respiratory issues especially where mould is maybe more involved. It can be GIT issues, you know, they can have diarrhoea and constipation, muscular pain, fibromyalgia, mood swings, night sweats, excessive thirst and urination, hormonal dysregulation which is a very, very commonly seen. A very interesting symptom that I do think is a little bit unique is static shock sensitivity so which I thought was quite interesting. So that is a little bit of a unique symptom when it comes to CIRS but, yeah, definitely a lot of globalised symptoms that you can put in the bag of chronic fatigue syndrome and a whole bunch of other ones. So those are the kinds of signs and symptoms and I guess especially in people where they're not finding any resolution with normal treatments, that's sort of like where you have to start looking for something more deeper or sinister going on that's perpetuating that inflammation. Andrew: With regards to the static shock sensitivity, that one interests me. Is that because they're sympathetically dominant and their alert reaction is heightened? Elizma: Well, you know, that is actually an interesting one because when I sort of like researched that, it seemed to be to do with the ADH with the Antidiuretic hormone, which is one of the Neuropeptides that gets dysregulated with something like CIRS. So the Antidiuretic hormone is produced by the hypothalamus and it's induced with the kidneys to conserve water. And so if you have low alpha melanocyte stimulating hormone which is another Neuropeptide involved in CIRS then that also likely lead to low Antidiuretic hormone. And so if the Antidiuretic hormone levels are low, then water is not actually being reabsorbed by the kidneys and so this is why people with CIRS will sort of like feel the need to urinate a lot more. And so you become more thirsty, you become dehydrated and then it creates osmolality changes and can make inflammation worse and sort of result in low blood pressure. But it's actually apparently this change in/of osmolality and also then the sort of like change in the delivery of oxygen and nutrients into and out of the cells, that can seem to make you more susceptible to shocks of static electricity. You know I may not have explained it as well as I should have but it seems to be more something to do in that kind of dysregulation system. And yes, that's the hypothalamus control so for sure, you know, we could definitely tie the sympathetic system, neurosystem in there as well. Andrew: So I'm imagining...you know, you said rabbit holes at the beginning and rabbit holes within the rabbit holes. I'm thinking about a big one here, how do we test patients for it? Elizma: Okay, so yeah. There is a lot of rabbit holes. So testing, you know, this is, I guess, where you can get sort of like differences of opinion. There's a lot of kinds of testing that you can look for. If you look at the general CIRS testing panels, you'll see that a lot of times they'll test for things like your MMP-9, your C3a, C4a, GGS-Beta1, MSH, VIP. That's sort of like the general panels that you will see on a blood test for something like CIRS. And you know all are just markers of various forms of immune activation and inflammation. They are very useful to measure to see if there is that chronic inflammatory response going on which is way beyond, you know, our average CRP-ESR testing that we have on the general blood panels. And they are also really good markers to measure if your treatment is working because you can just measure these markers from time to time and as they come down your treatment works, if not well then you need to look for something else. But there are...you know some people will, some practitioners will do a lot of the gene testing, so all those HLA-DRB genes that I was talking about. I personally feel that, you know, with my population, they don't have a lot of money so I have to be very careful with the kind of testing I do. So the gene testing is not the first test that I would do because in my opinion I don't really care what genes you've got, I'm interested in what's causing this inflammatory response. So I would tend to look more for the resources and so some of the testing that you can do is you can actually tested for all these mould Biotoxins and aflotoxins. But a very cheap test that you can do Andrew is the VCS test or the Visual Contrast Sensitivity test which there's quite a few websites where you can get this done. The Surviving Mold website is one of them, which is Dr. Ritchie Shoemaker's website as I understand. It costs you like $10 or $15. It's an online test and even though the online test is not as good as the actual in-clinic test, it is still a very well, widely available, easy to do test. And it just literally takes you maybe 10 minutes or so, it's a visual contrast test you do online and from that you can sort of get like a pass or a fail in terms of whether there could be a CIRS kind of response going on in a body. Because it measures the hyper or the hypo profusion in the capillaries of the eye, which is very highly affected when there's a chronic inflammatory response going on. And so it's sort of like an easy test you can do that if you fail it, you can say well okay there's something going on here, I think I may need to investigate this further, and then you can go on to do more expensive kinds of testing. Elizma: But there's also other testing, you know, there’s Neuroquant testing just more of a blind imaging kind of testing. There's really a lot of ways you can go about it. I think this where clinician skill comes at hand because you still have to think “what I do I think is the triggering here for this person?” Is it more of...do I suspect more of a mould trigger? Do I suspect more of a Lyme trigger? Do I suspect more of an environmental chemical trigger? Because that can also direct your testing as well and what are you going to test for here. But the general markers that I gave you there in the beginning are sort of like where a lot of clinicians start as the, "okay, yeah. We're dealing with CIRS now let's find the trigger for this." Andrew: Got you, so I just looked up so vcstest.com. Is that the correct test site? Elizma: Well, that's one of them yes, or you can go to Surviving Mold, I think it's a few websites that can...that provide this test. So Surviving Mold is another one where they have the test available there as well. Andrew: So approaching treatment now, and again here's another rabbit hole, you know, what...how do you treat stuff? I guess we've got to get away from treating CIRS as a label, as a box, as I said, and rather treat their particular issues, is that how you do it? You sort of personalise their treatment program? Elizma: Yes, that's how I would certainly do it. Again, you'll get lots of differences of opinions here because people like protocols and so there are certain protocols in treatment. The number one thing we have to do no matter who you are or how you approach this is you have to remove the exposure. So, you know, there's no point in getting just specific treatments whether it's antibiotics or herbs or what have you, if you haven't actually found the source and stopped the exposure. So because everything will just be useless until you do that. You know, toxins in, must be less than toxins out. And so this means you have to identify the source and remove it or clean it. You have to either then remove yourself from the environment completely, if you cannot clean it. Or you have to treat the infection if it is an infection driven process. So that to me is the absolute number one, is to identify and remove if you can. Because if you only treat the downstream effect, you know, if you go and test...and I think this is where the issue comes in, is we see, "Oh, this person's hormones are out so let's treat their hormones." or "oh, their, you know, serotonin is low." And if you just treat those downstream effects and not the root-cause then they'll just never get better. It just becomes a revolving door in and out of the clinicians’, you know, clinic. So that is definitely the number one thing. 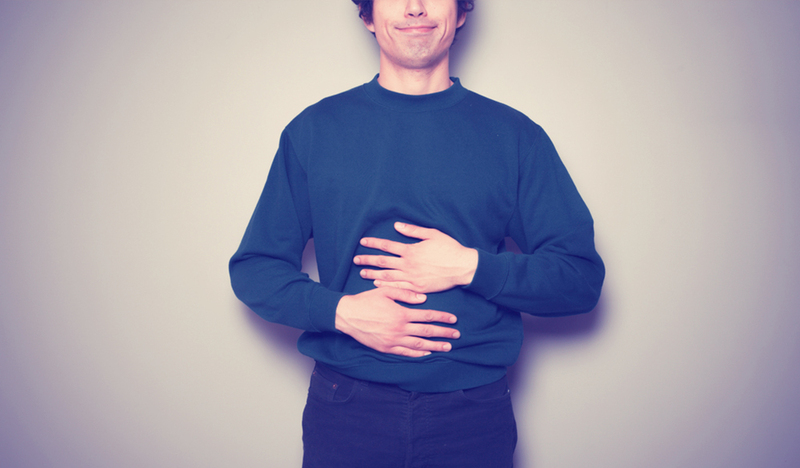 The number two thing for me, a big one is fix the leaky gut and this sounds like a broken record but my goodness, I mean, I think, that is such an important aspect and I, again, I don't want to just become the leaky gut kind of person and I'm not saying everyone has that. But I think that is...it's fair enough to say that I think that is an important issue for the majority of people out there, given our lifestyle. So if you have a leaky gut then your treatments are also going to be ineffective. So this is all just about making the treatment effective. You have to make sure that the gut is supported that is a big thing. Especially, you know, if you go back to the more Biotoxin example. All those HLA genes, they are, you know, the celiac genes are involved in there. And so a lot of these people will have a tendency to more of a leaky gut kind of, I guess, phenotype. The third thing for me that's very important is you have to make sure that their detoxification systems are working. And again you can treat them with all these things but if they're not detoxing you're just going to them sick, you're going to make them worse, they're not going to get rid of these things. Because one of the main reasons why people stay sick who have been exposed, is because they're not detoxing well in the first place. So you can't go ahead with treatment if they're not detoxing. You have to make sure their bowels are working, you have to make sure that the kidneys are supported, and the liver is supported, it's all those boring things that we don't...you know, we think well we need to find some fancy treatments, you have to have the foundations right. It's always about the foundations. So you know those are sort of like the key things that I would start off with. Once that's in place, you know, then I like to use binders. So binders are some of the things that I think is a very important thing to get in early on. Now if you are following sort of, the more of a Dr. Shoemaker's protocol in Cholestyramine or Welchol would be the kind of binders that would be used. But, you know, not all of us have that access. So you could use other binders as well, you know, more your natural binders like your zeolite, your charcoals, your bamboo, your modified citrus pectin. But I will emphasize there isn't...there hasn't been a lot of research done on this. I think this is where we're lacking a little bit and I think we really need to explore more in the future is we have not really, you know, done much research in a natural treatment or the alternative treatments for these kinds of conditions. So there's not really data on this, like I can't say that this is going to work or that's going to work, it's gonna be very much just a case by case process where you just have to try things and see if the person gets better or not. But it would be really...it would be so amazing if you could start getting more clinical data on this kind of stuff to see what actually works and what doesn't work. Because currently we have data on things like the Cholestyramine but we don't have data on any other kinds of binders. But I think that is a very important part in the treatment protocol as well as having binders on board. So that as you treat the person, that you can actually bind these toxins and lure them out and they don't get reabsorbed back into the system and just keep this inflammatory process going on. So that's sort of like a definitive core of treatment, you know, then there's lots of other spinoffs depending on which protocol you use and, you know, they use a lot of VIP treatments and things like that in the Shoemaker protocol. I think we still can learn more here about which way to treat people so I don't want to, you know, say too much about protocols because I don't wanna get practitioners stuck in that mindset. I think if we can...if we make sure the foundations are correct and then we just have to sort of look at what is the source and treat the source because you'll treat the person differently depending on whether it's a mould exposure or depending whether it's a co-infection or a viral exposure or a toxin exposure, your treatment will differ there. But the core foundations will always stay the same and so that will be my approach to treatment and then I will just sort of individualise from there on depending on what I think and is the key issue for them. Andrew: And I'd just like to remind our listeners that Cholestyramine is a drug and therefore must be appropriately monitored by a medical professional. And it's not without risk, it can have issues with thyroid, hormone absorption and there's a metabolic issue with salt, I think it might be chloride? Another major issue is constipation. What about any red flags that we need to be aware of? I guess the one that's, you know, upper-most in my mind when you spoke about urination was diabetes. How do you then tease apart red flags that you need to go, “oh, no, no, no”, hands-off I need you to get this checked out first. Elizma: Yeah, okay so there's a couple of check boxes that, you know, have to be ticked when you sort of suspect that this is more of a CIRS kind of pattern rather than something like diabetes. And so the tick boxes are when you find someone with multiple, unexplained or non-responsive symptoms. In other words you do the normal thing with whatever you think is going on with the person but they're not responding. So it’s those really have cases where you're just like, "man, this is just not going away and I thought it was gonna go." and you put your hands up and you say, "I'm a little bit lost here." So it's those kinds of cases you really need to look at, you need to look at past or current history of exposure to damp mould or water-damaged buildings or tick bites or anything like that. Usually they like to include that there has to be at least one HLA-CO, a susceptible genotyping there. I don't know if I would put much emphasis on that but that is one of the criteria that they would sort of put a red flag on. And also, where the person shows that pattern of an innate and inflammatory response. Now, something that to be aware of Andrew which I thought was really, really interesting and this is I don't think the paper is published yet and it may be published a little bit, you know, in the next few months. But doctor...I think it's quite relevant to just mention this because of the testing that we're doing and we need to understand the pitfalls of testing as we are doing it currently. Dr. Dietrich Klinghardt and Dr. Marco Ruggiero, I hope I've pronounced their names correctly, but I have huge respect for them. Because what they've done is they have actually developed like a unique way of testing for chronic infections. Because one of the things that we’ve found is that a lot of these chronic infections, co-infections such as Borrelia and such as Lyme but I think many others as well. They can sort of like set up compartments in the body and they can hide really well. So they're not necessarily in the blood, they're usually sitting in the tissues and sitting in the cells. But what are we testing for? We're testing for blood. I cannot tell you how many things I have seen for Lyme that it comes back...it's not really positive, it's not really negative it's sitting there somewhere so they put it as a fail. And what we need to understand that you can, you know, if you have chronic Lyme, if it's acute, yes, you'll pick it up in the blood, but its chronic infections, they could sit in the right Hippocampus of the brain but not necessarily in the entire brain. Or they can sit in the brain stem and not in the liver, you don't know where these infections are sitting. They can be in biofilm, they can be inside cells because they don't really move around a lot. So what they found is that if you want to test for a chronic infection, you have to coax them out. Because we're not really doing tissue samples, we're not doing biopsies, we're doing blood testing. And so Dr. Klinghardt and Dr. Ruggiero they've developed like a unique way of testing where they will actually use ultrasound treatments in the brain, in the thymus, in the Spleen, the vagus nerve, and the brain stem. And they, in this way they're driving the microbes out of these areas. And then some of these microbes will then spill into the blood stream and then it can be tested for in blood or there’s now...I think there's a new test available now where they actually collect the urine and then do PCR testing on the urine and then that's where they will test for or look for whole strands of DNA microbes in the urine. So they’re actually finding now where tests previously came up negative now they're coming back positive. And so I did want to emphasise that because I think we get fixated on testing and realise, "oh well, the test was negative." so that's it. And we need to understand the limitations of test and what are we actually testing for. Because I still, you know...you cannot treat the test you have to treat the person, you have to look at their case history. If they're chronically inflamed and you know that there is something going on but the tests come back negative and you just believe in the test and then you don't treat the person because the test says there's nothing there. You have to understand the limitations of those tests. so I just thought that is a really important thing to point out because as practitioners we do get...we can get really stuck on these things because it is easy, we want the answers given to us but sometimes the answers are not there and you have to understand the limitations of that. So I just thought I'd point that out as another kind of a risk factor in getting the diagnosis wrong just because you relied too much on what a test is telling you. So I just thought I'd put that one out there as well. Andrew: Where can people get further information and resources, education on this topic because it seems to be very involved? Still not without some areas that need to be cleared up but, you know, I think there's some people working on it diligently. Elizma: Yeah I mean the research just keeps on coming out and there's some very exciting things in the pipeline which I'm busy investigating as well. But if they want to go and, you know, I'm assuming that a lot of the practitioners here will be very new at this or fairly new at this and they just want to get sort of like some kind of idea of what to look for and treatment. And there's a couple of resources you can go to, one of the...there was just very recently a talk done in U.K. by the Academy of Nutritional Medicine which was on the whole CIRS kind of syndrome. And there was a few very, very prominent speakers there and they can download the notes from the website its www.aonm.org. If they go there, there were some brilliant speakers, Dr. Jess Armine from Bio-Individualized Medicine, Dr. Dietrich Klinghardt, Dr. Armin Schwarzbach, they were all speakers at this conference and the notes you can just download them and read through them. And then obviously Dr. Ritchie Shoemaker's website survivingmold.com is another really good resource as well. Dr. Keith Berndtson which is an MD from Park Ridge MultiMed Clinic, I don't have his website but that's definitely another person that you could look into and follow up on. These are all people I really respect in the community of CIRS and they all have a slightly different take on it. 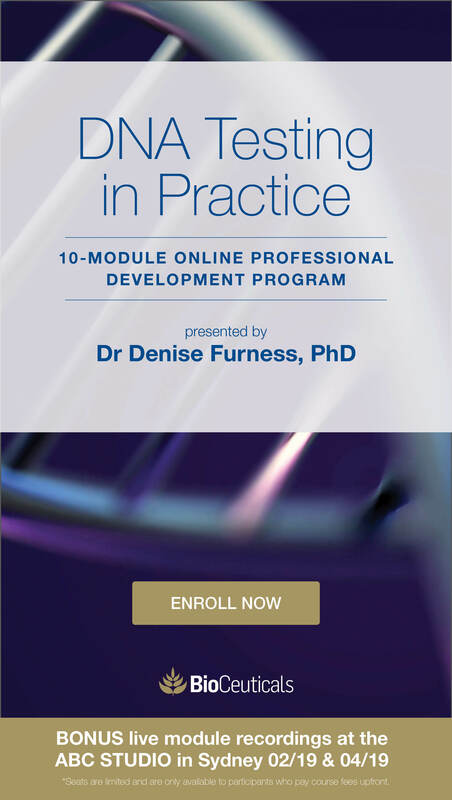 You know some of them will focus more on infection, some of them will focus more on mould or other things but, you know, these are great resources to go and have a look at if you want to sort of learn more about it. Andrew: So we'll definitely put aonn.org up on the FX Medicine website for our listeners and some other resources there as well so that people can learn more about this very complex issue. Elizma, any further points that we need to sort of add in just before we wrap up? Elizma: Um, Andrew, I want just to mention that the most important thing for me that I would like to leave practitioners with is...and I have said that before, "always treat the patient don't treat the test." You have to really take very, very good case history and you have to do a timeline with them. Timelines are so important, you have to see where was the point when things started changing for them because that's where your answer is going to be. So, you know, it could have been a viral infection they had as a teenager, it could have been an exposure to a toxin and where they were working at or, you, it could be like I said a tick bite or when they moved into a new home or older homes, still home where they could be exposed to mould. The timelines are so, so important because that's going to give you your answer in where your next test will lie. Instead of just doing the whole barrage of testing, do a timeline, see what you think where the first exposure happened and that will direct you to your next step which would be testing and finding the root-cause. Andrew: Elizma Lambert, thank you so much for taking us through those rabbit holes within rabbit holes which is CIRS and really teasing apart the relevant points for patients to get better. I love what you said, "always treat the patient not the test." Thank you so much for joining us on FX Medicine today. Elizma: Well it was a pleasure, thank you so much Andrew.